“Room Enough” featured in Post Magazine! 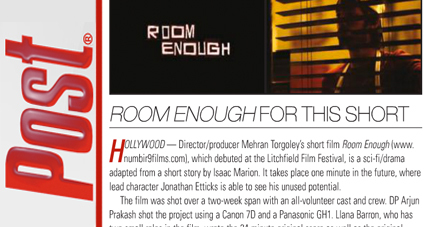 This February’s issue of Post Magazine features an article on the short film, Room Enough (2011), by numbir9 films. The film’s award winning 24-minute original musical score was composed and performed by Llana Barron. The Post article can be viewed here. In addition to the score and the original song, “Split”, which was written for the film, Llana also stars as two small roles. The film is now available online for free viewing! Click here to watch Room Enough!